Oh, those lovely and perfect gardenias are the perfect focal point doe this vase. They are beautiful! And I have to remember the Angelonia for next growing season– that lighter violet color is so different. Angie, thanks for your comment. I tried to let you know on your blog how I admire your beautiful dahlias, but the comment wouldn’t go through. A beautiful vase and I see your gardenias are still blooming. My garden is also overgrown, but I collect seeds, so I will need to wait until they ripen before clean-up. Thanks. Yes, the gardenias are opening a few more at a time–welcome at this time of year. Good luck when you begin your cleanup. The gardenia fragrance was wonderful last week so decided to enjoy them again this week. 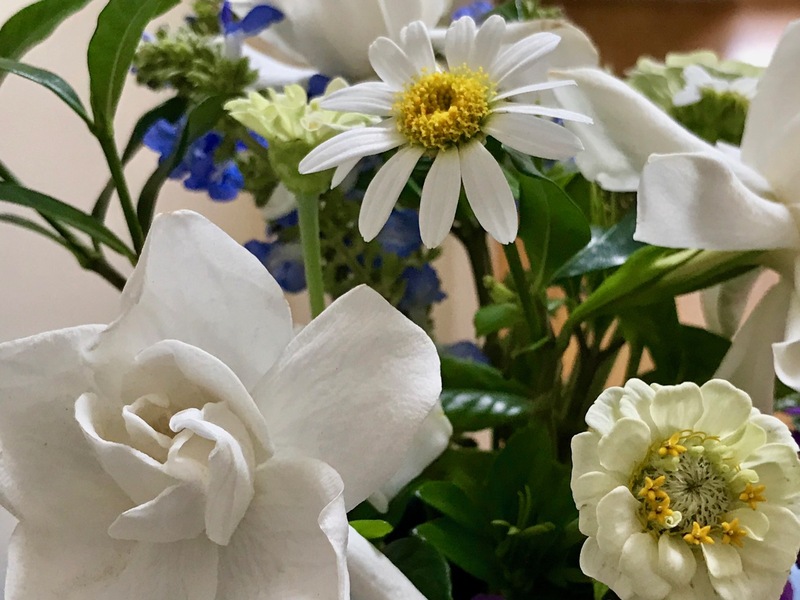 Your bouquet must smell divine with Gardenias in it. Like Cathy’s, all that blue and white looks quite summery still. The scent is really pleasant. I think I rebelled at the thought of using fall flowers. I have swamp sunflower in full bloom, a dainty white aster and callicarpa but I’m upset with all three as they’ve bullied their way into unwanted areas. I love the fresh and clean combination of blue and white. 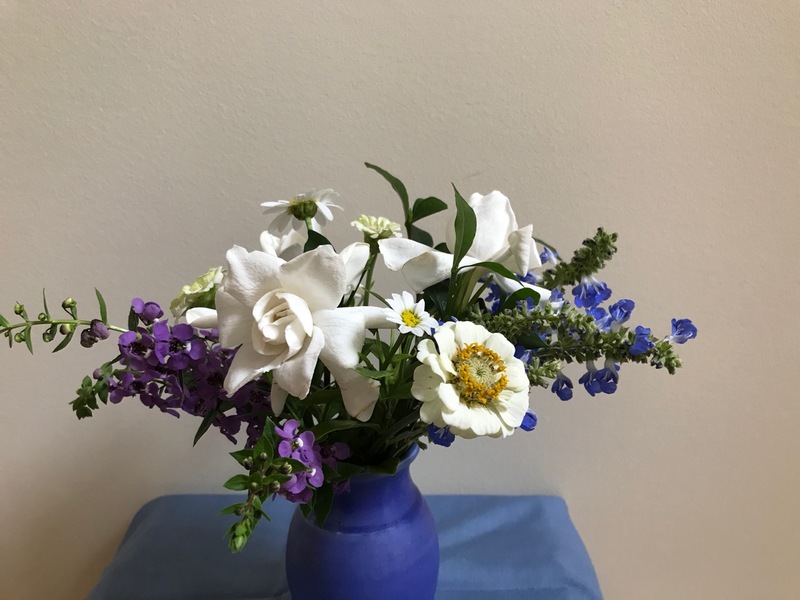 This arrangement is the perfect balm for the soul weary of the garden’s often wild appearance this time of year – chaos to order in a vase. I can almost smell the heavenly gardenias! Happy autumn. 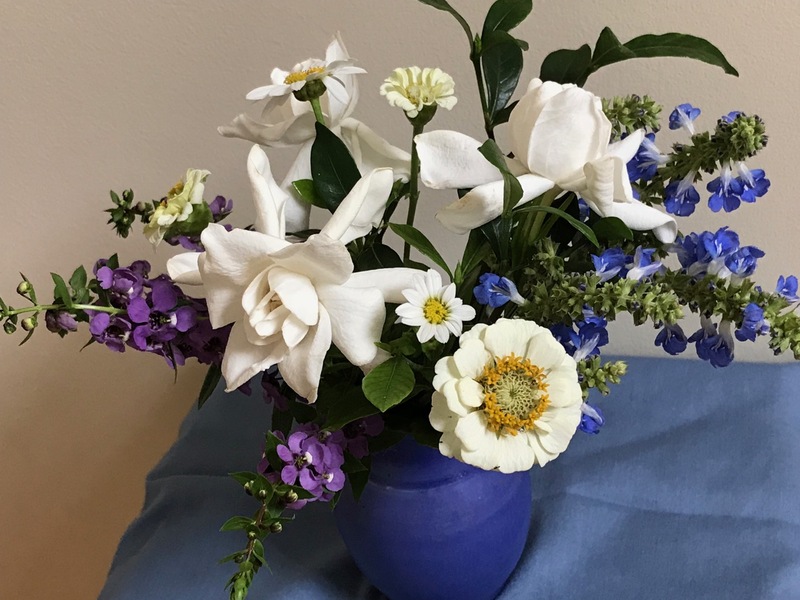 I like that phrase, “chaos to order.” Maybe that’s what flower arranging is all about. Fresh and lovely! I bet the scent is just as delightful!! You have blue too! And the matte glazed vase is such an asset for this vase with the pristine whites and contrasting blues, definitely not an autumnal look. I am glad you found these lingerers to share with us and hope you enjoy giving your garden the tough love it needs in due course. Yes, I was delighted to see your blue this morning as well! Judy, so glad you enjoyed the gardenias. They’ve made my heart sing the past week. This is such a refreshing mix, Susie. The unblemished gardenias are gorgeous but I was really taken by the pristine zinnias. I’m finally seeing a few cream and white zinnias too. It’s odd that they lag their more colorful cousins. I like having the white zinnias Kris. This year I had a nice selection of oranges and peaches as opposed to just lots of pinks, which often happens in a mix. Seeing your dahlias makes me wish I’d been more attentive when it was time to plant them here…next year though! Looks like a Renaissance still life,beautiful photos. The Angelonia here has had several stops and starts this summer, mostly stops! I am just starting Zinnia seed, the whites are lovely. 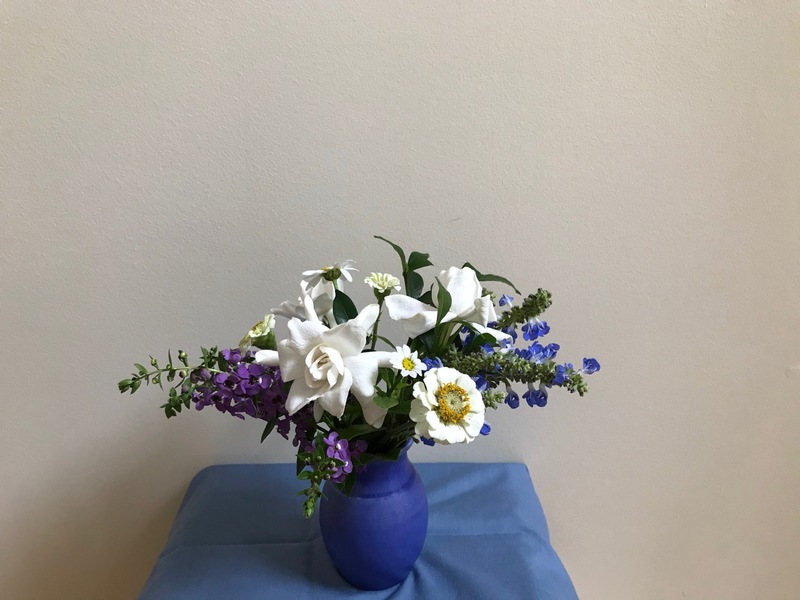 Blue or blue and white was a popular colour this week; I always love blue and white together so this is a favourite among your vases. Wasn’t ready to resort to more autumnal colors. Plenty of time for that. Ah, white! My favorite. I think it should be ‘White and Blue’ rather than ‘Blue and White’. I mean, we all know that the blue is only there to show off how excellently white the white is! That gardenia ROX! They do not do well for us, and do not often bloom on stems worth cutting. My then next-door neighbor rooted this gardenia in a little yogurt cup 17 years ago. It’s been a wonderful shrub. The best ones have the oddest origins. The one that did so well at my grandmother’s home was one of those small florist type potted plants that gets forced into bloom, and typically gets thrown out when done blooming, like a poinsettia. The expensive ones from nurseries do not survive long. I really like the blue salvia in there with the whites and yellows of the zinnia centers. It all looks so clean and fresh even if it sounds like autumn has entered your garden. Thanks. That blue salvia shed a bit too easily once I brought it indoors. Hummingbirds have enjoyed it. Love the way the floral material fans out from the vase. Your gardenias are perfectly pristine and I can nearly smell them in my imagination. Aren’t memory and imagination wonderful? Love this – especially the Bog Sage with Gardenia. 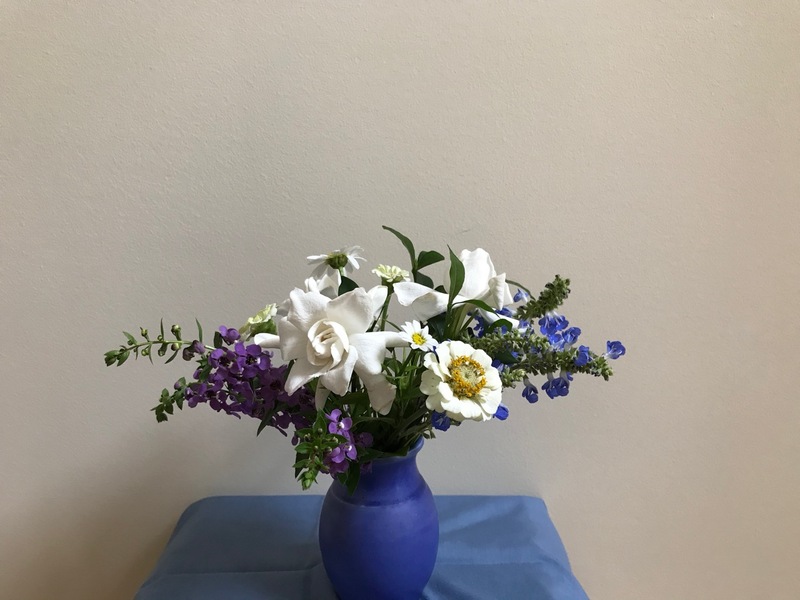 The gardenias are lovely Susie. And that blue salvia really is true blue, especially when seen with the purply blue of the Angelonia.